Half day tour in north Corfu. Transfers Corfu, in cooperation with Vido’s Travel has created this unique half day tour ( 4-6 hours long) to discover the island of Corfu. Your tour will begin from your hotel or your accommodation place or even the main port of the island just a few meters away from your cruise ship and you will be transferred to your first destination to a kumquat distillery to enjoy free sampling of all the different kind of kumquat products. A visit to a kumquat distillery will give you the chance to see all the stages of production of kumquat liqueurs and sweets and even purchasing a few as a gift for yourselves and your friends at factory prices. Next stop of your tour will be Paleokastritsa. 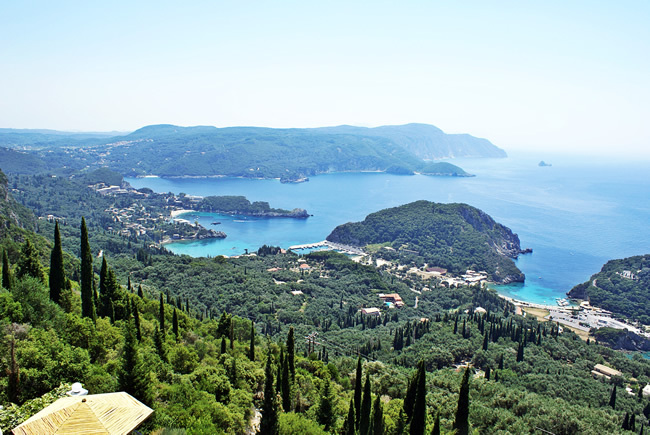 Paleokastritsa is situated 26 kilometers northwest of the beautiful town of Corfu. 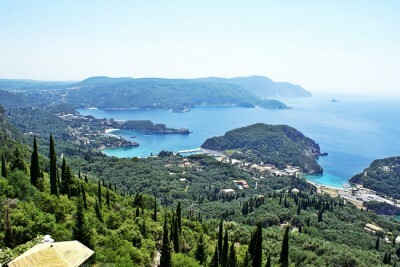 From the monastery and the wonderful Paleokastritsa bays your tour will continue up to unique village of Lakones. The small village of Lakones is located 4 km away from Paleokastritsa, to an altitude of 182 m. It has preserved the old spirit with its stone houses from 18th and 19th century. Getting there on the narrow and steep road gives a bit unpleasant feeling but the view of Paleokastritsa and its bays seems more and more spectacular as you proceed up. Lakones with its surroundings is also known as Bella Vista, one of the top 10 views in Europe. Along the road in and out of the village you will find cafeterias where you can enjoy the view while drinking your coffee and some restaurants to have your lunch. Upon your request your bus driver will transfer your next tour destination ,the center of the Old Corfu Town and leave you there to discover the beauty of the old city with its unique monuments, buildings, churches and museums. Your tour finally will come to its end with your safe transfer back to your hotel or your cruise ship.